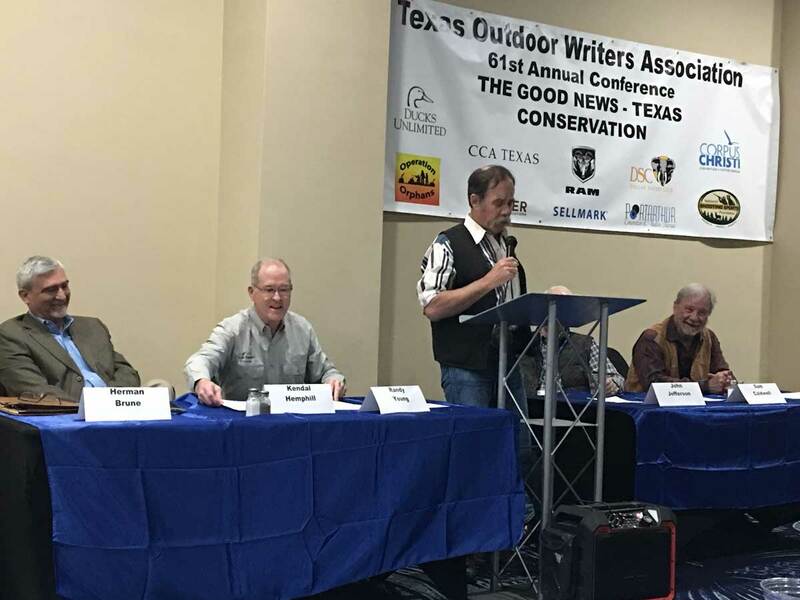 OPINION — When my wife and I traveled to Corpus Christi a couple of weeks ago to attend the 61st annual conference of the Texas Outdoor Writers Association, I expected to be roasted. Figuratively. One lucky TOWA member is fortunate enough to be publicly denigrated and humiliated every year, and I happened to be on the menu for 2019. A roast is where several people who have known the victim for a good while are invited to regale the audience with past examples of the honoree’s most spectacular mistakes, failures, and demonstrations of general ineptitude. It’s always nice to know your efforts count for something. My positive accomplishments may be lost to posterity, but I remain confident in the fact that my friends will never forget the stupid things I’ve done. Now, I’ve been privileged to be on the roasting panel a couple of times in the past. A few years ago I helped barbecue Roy and Ardia Neves, my publishers at Texas Fish & Game magazine. Last year my friend Louie Bond, editor of Texas Parks & Wildlife magazine, was on the menu. Louie and I enjoy playing our guitars and singing badly at the conferences, so I wrote her a parody to the tune of Willie & Waylon’s ‘If I Can Find A Clean Shirt,’ and performed that at her roast. I admit it was off key and out of tune, and the lyrics were pretty lame, but no one could accuse me of not being loud. So I’m not exactly new to the cookout program, but this was my first time on the spit. My friend, Herman Brune, the current TOWA president, wouldn’t tell me who my roasters were. He said it was supposed to be a secret. I pointed out that every time I’d been involved, the roastee always knew who to be angry at ahead of time, but Herman was adamant. So my wife and I were standing in the lobby of the Radisson Hotel, and Randy Young walked in. Since Randy lives in Abilene, and I had no idea he would be in Corpus that weekend, I should’ve known something was up. He claimed he was there for an ex-county judge meeting, which I accepted on the grounds that county judges probably get into the habit of attending unnecessary meetings for years, and just can’t stop after they retire. As it turns out, Randy was one of my roasters. I had been under the mistaken impression that you had to be a member of TOWA to do that. I was wrong. In a classic example of the past coming back to haunt me, Herman had conspired to bring Randy to Corpus to aid in my public disgrace. Herman and Randy wouldn’t know one another at all if I hadn’t made the mistake of inviting both of them on an adventure in Mexico fifteen years ago. Randy had drug me along on a Chain Gang bicycle ride from Houston to Abilene, 385 miles, in August, and I had retaliated by taking Randy to Mexico to rappel and swim and walk down the Carrizo River. My cousin, Gary Doyle, also wanted to go, but none of us wanted to drive our vehicles to Mexico, so I called Herman, and we went in his pickup. The trip was epic. Which means we survived but we almost didn’t survive. The events of that trip made up a substantial portion of the subject matter at the roast, since Herman was also on the panel. Just after we had crossed into Mexico at Nuevo Laredo, I had made the mistake of mentioning there was no law against drinking and driving south of the border. Herman was driving, and he follows a strict, personal rule about alcohol. He never imbibes unless he’s alone or with someone. So Herman decided to stop and grab a six-pack, which he proceeded to drain during the two-hour drive to Monterrey. The Mexican night whizzed by while Randy repeatedly offered to drive, but Herman kept insisting he was fine. He said he drove better when he was drinking, and I had to admit it was true. We camped in a riverbed that night in the mountains west of Monterrey, and Herman was a little reluctant to crawl out of his soogan the next morning. Things went pretty well after that, except for the fact that I missed a trail and we got lost. We finally made it back, barely. My old friend, John Jefferson, helped roast me, and told some stories about me I had forgotten. I still think he made a lot of it up. But John is my favorite outdoor writer and photographer, and I have a picture John took of my youngest son with his first deer, so he can say whatever he wants about me. 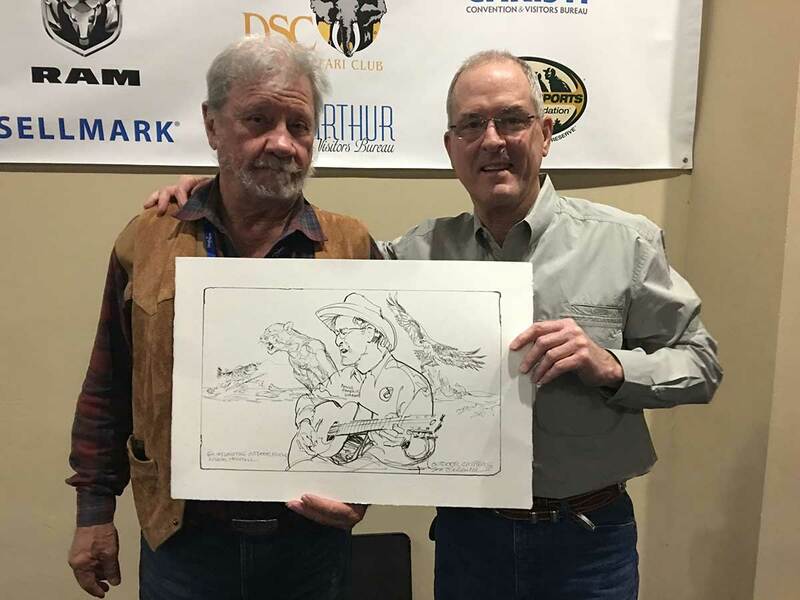 Legendary Texas artist Sam Caldwell filled out the panel. Sam and I have hunted geese on mornings when it was too cold for the geese. He gave me a picture he drew of me, which is now one of my most cherished possessions. You never know when you might be the guest of honor at such a dishonorable event. My advice is to make sure you know as much about your friends as they know about you. As bad as it is when people lie about you, the truth could be a lot worse . . .